This 1767 engraving, published in Great Britain and attributed to Benjamin Franklin, warned of the consequences of alienating the colonies through enforcement of the Stamp Act. The act was a 1765 attempt by Parliament to increase revenue from the colonies to pay for troops and colonial administration, and it required colonists to purchase stamps for many documents and printed items, such as land titles, contracts, playing cards, books, newspapers, and advertisements. Because it affected almost everyone, the act provoked widespread hostility. 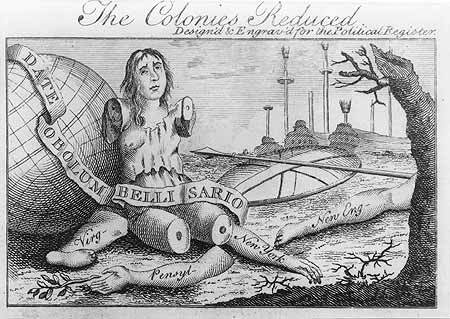 The cartoon depicts Britannia, surrounded by her amputated limbs—marked Virginia, Pennsylvania, New York, and New England—as she contemplates the decline of her empire. Franklin, who was in England representing the colonists’ claims, arranged to have the image printed on cards that he distributed to members of Parliament. Source: The Colonies Reduced. Design’d and Engrav’d for the Political Register, 2 3/8 x 3 7/8 inches, 1767—Prints and Photographs Division, Library of Congress.